[181 Pages Report] The automotive industry has evolved in terms of its powertrain, drivetrain, safety, and stability. The increased awareness about active safety amongst the buyers led to increased demand for various in-built safety features in the vehicle. The reasons such as increase in per capita income and growing infrastructures with booming economies have boosted the demand for the comfort, luxury, and driving dynamics. The increased aforementioned needs for safety and enhanced driving dynamics have pushed the Original Equipment Manufacturers (OEMs) to introduce systems which cater to this demand posed in the current environment. The recent examples of such systems which have enhanced the stability of the vehicles with increased power and fuel efficiency are 4X4 drive (or 4-wheel drive – 4WD) and all-wheel drive (AWD) systems. In the AWD system, the power is transmitted to all the wheels of the vehicle to improve the traction and control of the vehicle. The system engages a secondary axle before the slippage occurs, and also distributes the torque equally between the axles when the vehicle is turning. Alternatively in a 4WD system, the driver can decide the wheels in which the torque has to be sent. The 4WD systems are electronically and manually actuated. The increased use of sports utility vehicles (SUVs), extreme climatic or terrain conditions, increased need for stability, and enhanced driving dynamics by the customers have together played a vital role in the enhancement of the these multi-wheel drive systems. In the coming years, the increasing demand for luxury cars in the regions such as Europe and Asia-Oceania is expected to drive the market. 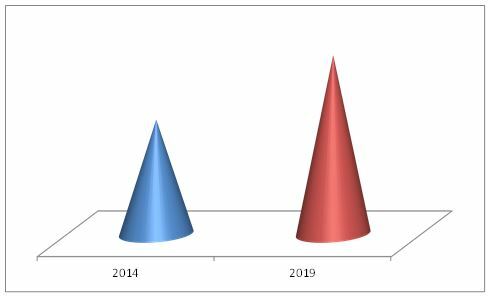 Sustainable growth in the multi-wheel drive systems market is expected to largely depend on upcoming legislations in various countries. Multi-wheel drive systems have a large penetration in developed countries, while legislations in developing countries are rapidly catching up, creating high-growth opportunities. The global market for multi-wheel drive systems is projected to grow at a CAGR of 8.35% from 2014 to 2020. The multi-wheel drive systems market for passenger cars had the largest market share of about 62%, in terms of value, in 2014. This report classifies and defines the automatic and manual multi-wheel drive systems market in terms of volume and value, with comprehensive analysis and insights on the multi-wheel drive systems (both qualitative and quantitative). It highlights potential growth opportunities in the coming years, as well as it covers review of market drivers, restraints, growth indicators, challenges, legislation trends, market dynamics, competitive landscape, and other key aspects with respect to multi-wheel drive systems. The main drivers for the automotive multi-wheel drive systems market are the growing demand for SUVs across the globe, unfavorable terrain for safe driving, and increasing demand or improved safety, stability, and performance. 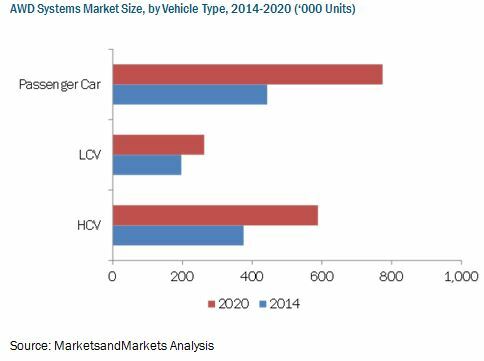 The report covers the multi-wheel drive systems market in terms of volume and value. Market size in terms of volume is provided from 2012 to 2020 in thousand units, whereas the value of the market is provided in $Million. The key players in the automotive multi-wheel drive system market such as ZF Friedrichshafen AG (Germany), Magna International Inc. (U.S.), BorgWarner Inc. (U.S.), Continental AG (Germany), and JTEKT Corporation (Japan) have also been identified and profiled. The global multi-wheel drive system market is analysed in terms of volume (thousand units) and value ($million) for the below mentioned system types, vehicle types, and regions & respective major countries. The automotive multi-wheel drive systems market, in terms of volume, is projected to grow at a CAGR of 7.75% from 2014 to 2020, to reach 19,045.9 thousand units by 2020. The automotive industry is inclined towards using advanced technologies to reduce crashes and mitigate the impact of accidents on passengers. The multi-wheel drive systems play an important role in achieving both the targets. Multi-wheel drive systems have evolved from the need for better fuel efficiency, safety, stability, control, and driving experience. These systems offer these features, prompting automobile companies to invest extensively in such systems. The market for these systems is driven by the increasing demand for the SUVs globally, as well as due to the unfavorable terrains prevailing across various regions. In Europe and North America, the automatic and manual AWD systems are well-established and have a higher penetration rate. The use of these systems has grown significantly in the Asia-Oceania and RoW regions, following an increase in the consumer purchasing power and their preference for better safety measures. China, the U.S, Germany, and the U.K. are expected to be the largest markets for the multi-wheel drive systems. Developing countries such as India, Brazil, and Mexico are expected to show promising growth in the demand for automatic and manual AWD systems from 2014 to 2020. The global automotive multi-wheel drive systems market is dominated by players such as ZF Friedrichshafen AG (Germany), Continental AG (Germany), Borg Warner Inc. (U.S.), and JTKT Corporation (Japan). 6.7.4 Haldex GEN V All-Wheel Drive System – By Borgwarner Inc.
6.7.5 Dynamax All-Wheel Drive (AWD) System – By Magna International Inc. Figure 35 Manual AWD System has the Largest Market Share in the European Region.